So much has happened since I last posted. Life has changed beyond my wildest imaginings … Sometimes, I take a moment, a pause, a breath – and I wonder… How did I get here? How was I so lucky? There are times when I realise its not luck – I have had a life which, good and bad, has been a struggle in finding my voice and my truth. Now, in my 40s, I am coming into my self – and it is real grounded happiness. I know this: when you live a life that is true to your core self, when you recognise your passion and your joy – then anything is possible. Since I graduated from Ballymaloe, I have been traveling the world. But I have always returned to Ireland. There is something about this place – the feel of it – that draws me back. I think I may have found my place in the world. And certainly, for now, I have found my cottage, by the sea, and my bliss. 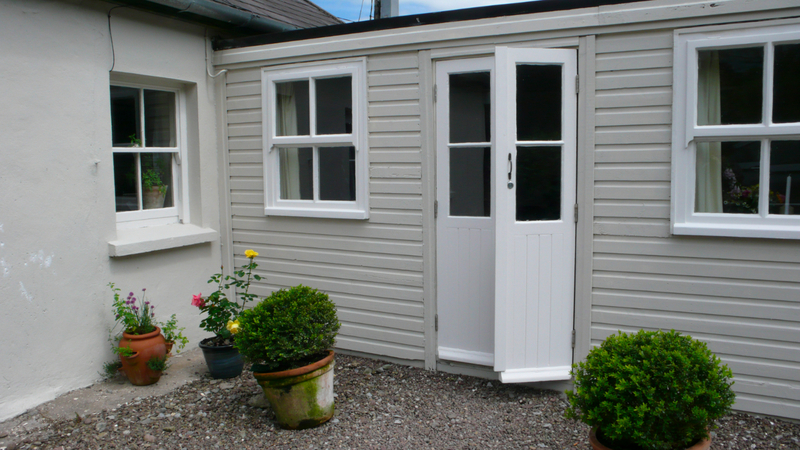 Not only was I inspired, but I also decided I needed a base here in Ireland – and I found one. 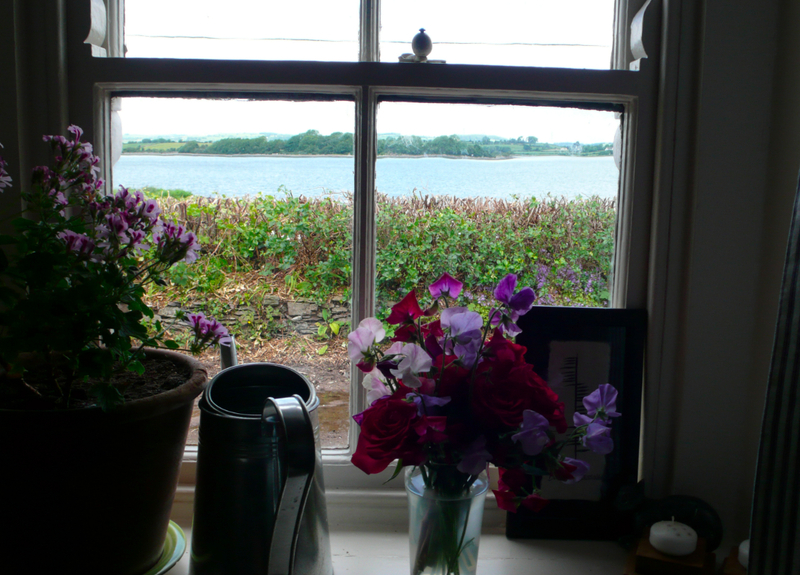 My friends agreed to rent me their cottage, in East Cork, by the sea. 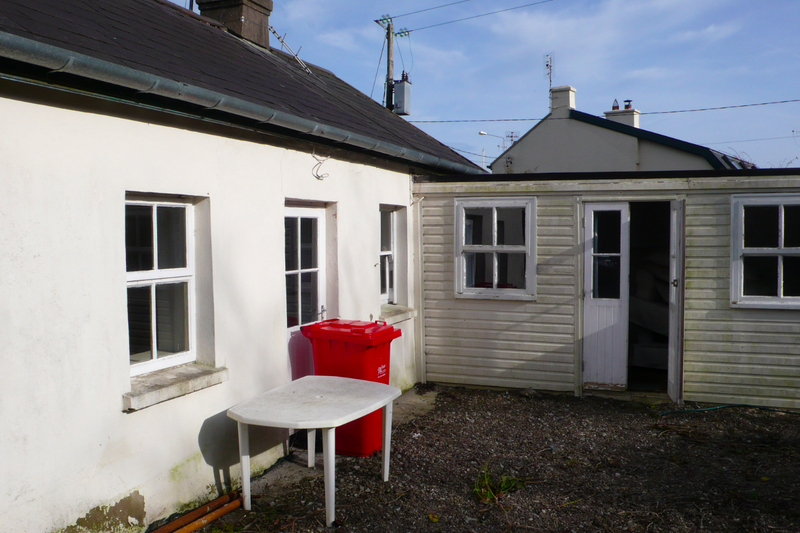 I am 5 minutes from Midleton town, in an 1890’s labourers cottage, with a remarkable history. When I first saw the cottage in March, it looked like it needed some work, but the bones of the house were beautiful – I could see that. When I returned to Ireland in May, the house had been transformed – and I did a bit of my own personalisation to make it complete. 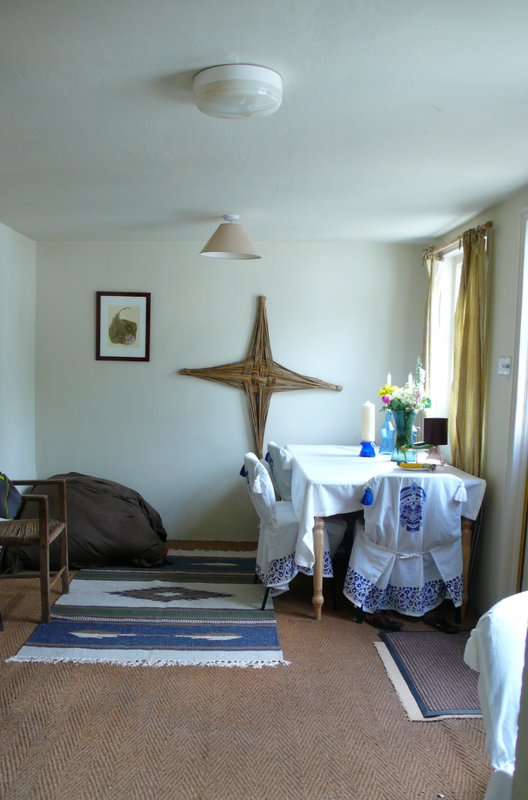 As I have settled into my home I have felt it embrace me – and have been grateful for the sacredness of living in a place which is truly nurturing. The silence of living out in the country is amazing – because its not really silence. The sounds of the animals, the wind, the rain, the sea, all surround me. The freshness of the air, the clarity of the sunshine on skin … I soak these moments up after having been cooped up in a city for all my life. I go to the Ballymaloe farm and collect fresh vegetables from the greenhouse and raw milk and I come home and I cook and welcome those I love into my space. I am blessed. And so thankful. 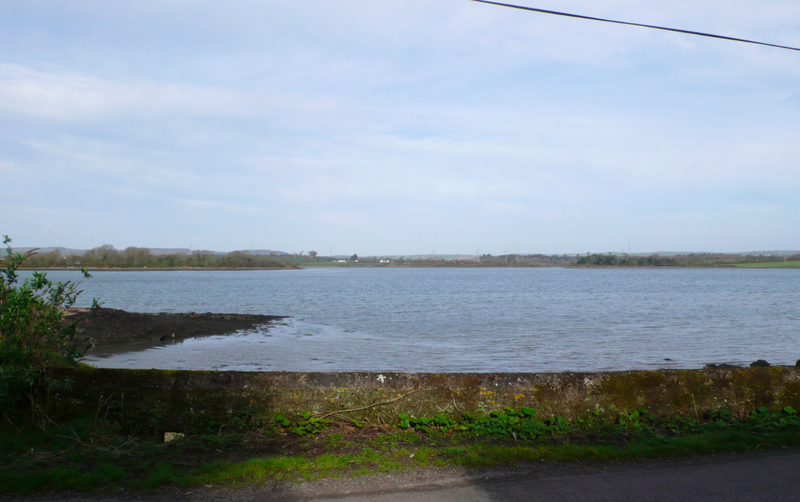 This is the view from my cottage in March 2012 when I first visited. 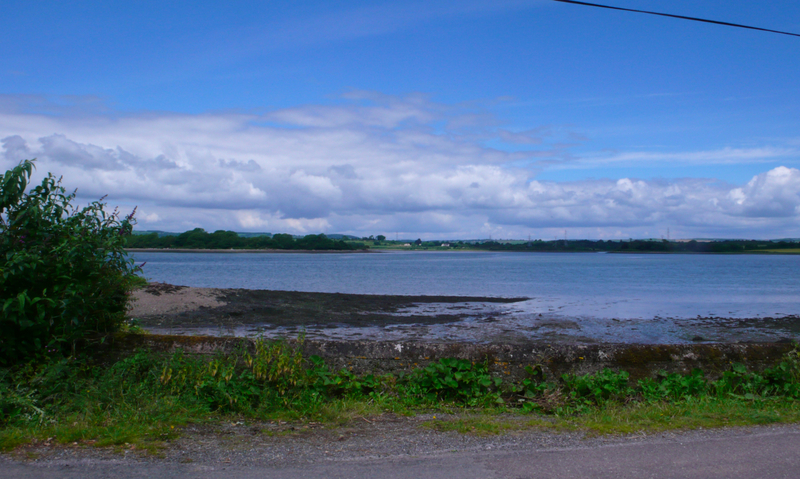 The cottage is located directly across the road from the water, which is an estuary that leads to the sea. So there are tides, and the scent of the sea, without the wildness of being directly in the face of the ocean. 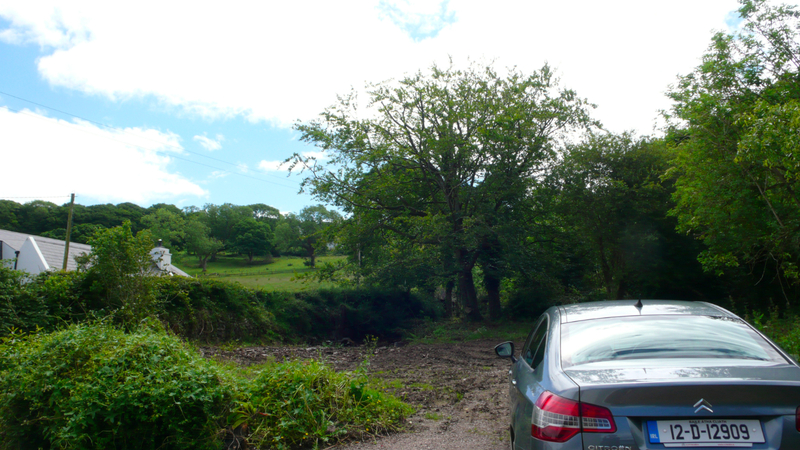 And this is what I saw when I returned in May 2012… amazing how green it gets! And sometimes, I am pottering around the cottage, and I look out the window and I am transfixed by how the sky changes and melds with the earth and water. 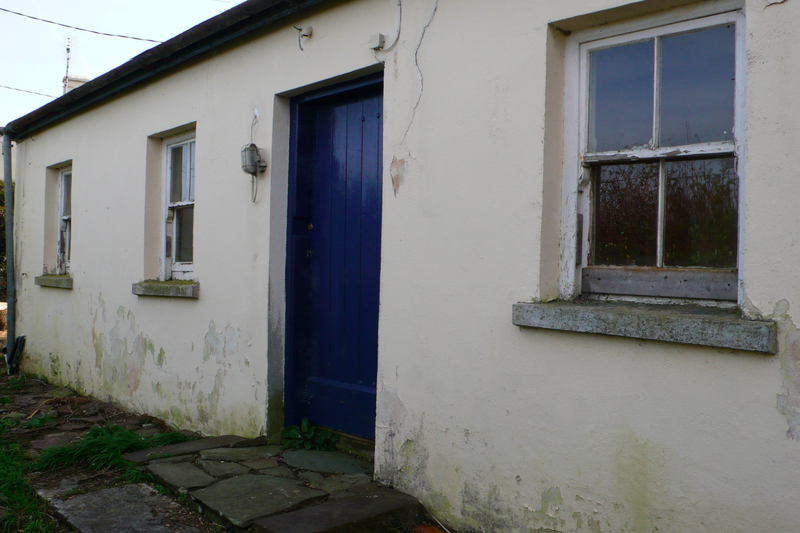 And when I returned back to Ireland … it had been given some TLC – paint and flowers and gravel. Amazing how different it looks, and feels. Brighter, and lighter, some how. Just goes to show that a little bit of love goes a long way. 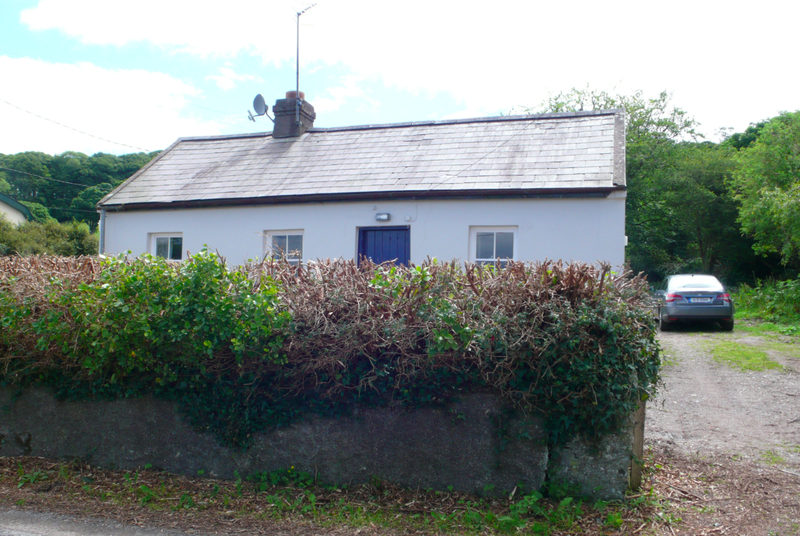 My cottage from the road – clean and repainted, with the hedges newly cut. This is the overgrown backyard in March 2012. It was so chaotic I had no idea how large the garden really was. And this is the garden when I returned in May. 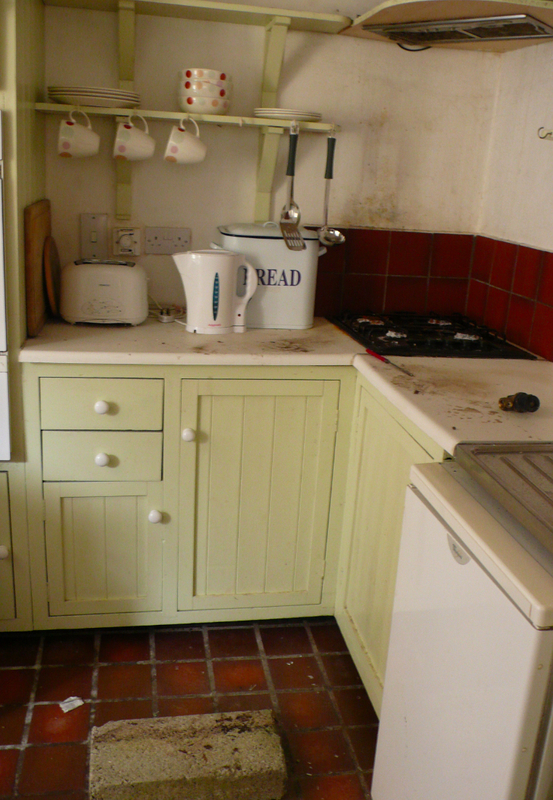 Its been tidied up – but it needs a huge amount of work still. 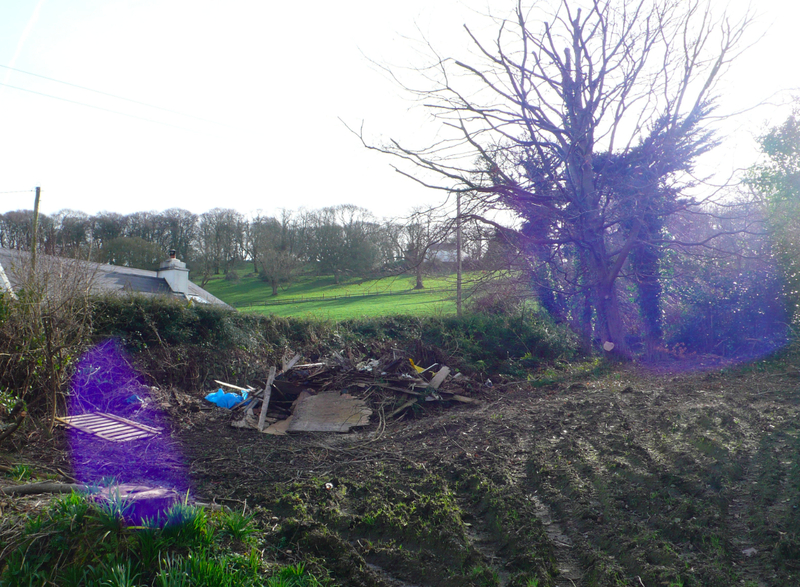 What I didnt realise is, there is an acre of land attached to this cottage, and most of it is wild. It will take a good couple of years I imagine to bring it back to its glory. 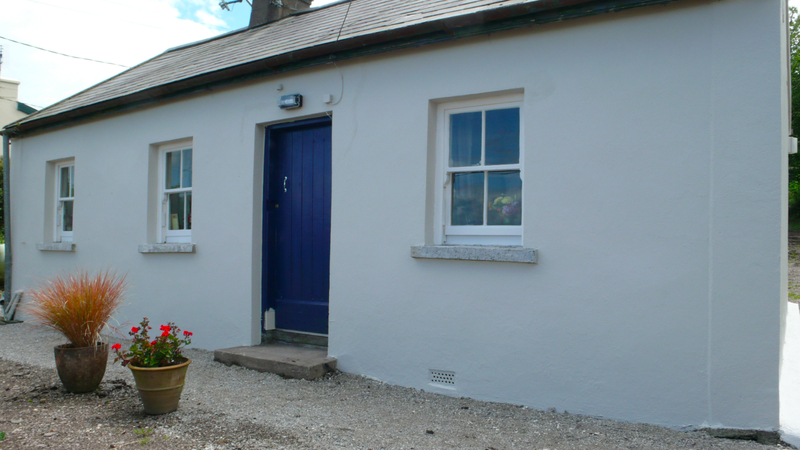 This is the back entrance as I first saw it – an extension was built onto the cottage, and the back door you see open here is used really as the main entrance. And this is how it was when I returned. The paint colour is “Mucky Swan” !!! I think its gorgeous – and I love my plants out there. Ive added a few roses and delphiniums since so there is a riot of colour as you enter. This is the view from the entrance of the extension. They even put a picnic table up outside! Its gorgeous on the (few) sunny days to sit out there … pure joy. 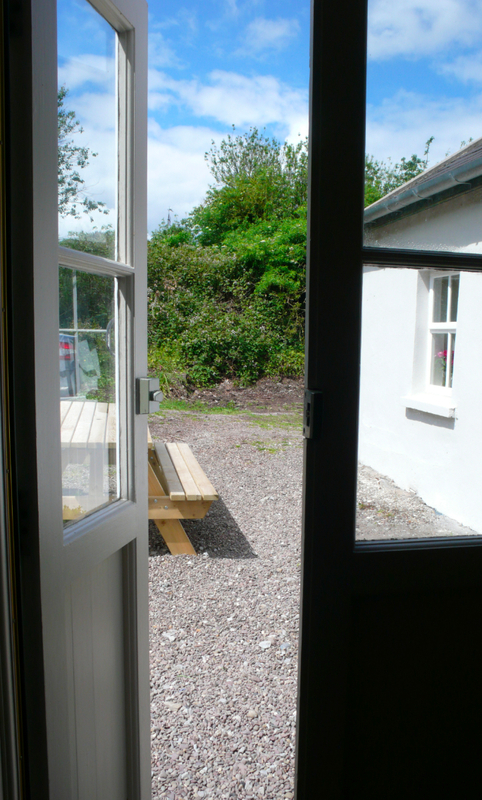 And this was the view of the extension from the kitchen doorway. This is the extension as it is now. New lighting fixtures, a lot of cleaning, and paint. I found the St Brigid’s cross (meant to protect hearth and home) at a craft shop on my travels. The rug is from India (via Ballymaloe House shop), the chair covers are from Ikea and the beanbag is from Groupon! Dining table in the extension. Lovely how some flowers and candles can brighten an entire space. What makes it even more satisfying is that most of the flowers you see are from my garden. Who would have ever thought I would tramp around outside and pick and arrange flowers? To the left of the entrance, Ive also created a little work space (it will have a desk eventually). Ballymaloers will recognise the four compartment recycling bin. I also have a little composting bucket on top of the bin. I found a great deal on a printer (50 euros) at Tescos. The painting on the wall is by Lydia Allen and is the menu for our graduation dinner at Ballymaloe Summer 2011. The kitchen viewed from the living room. 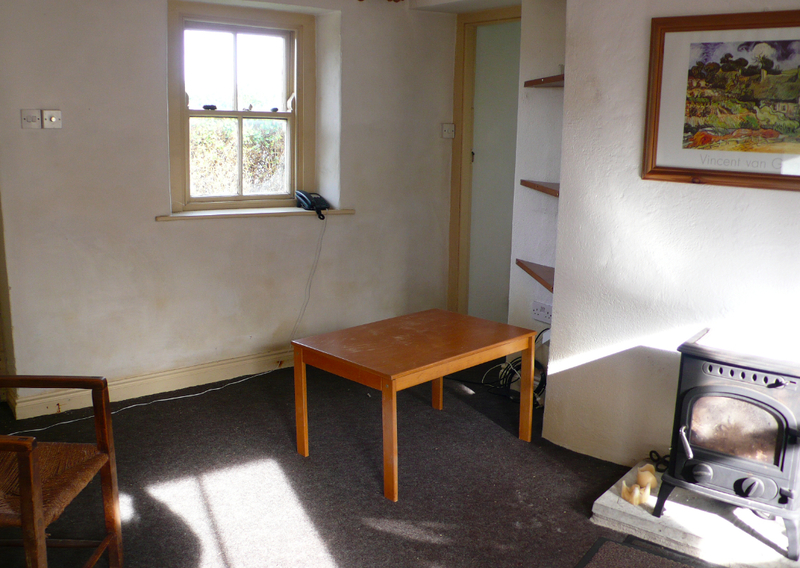 Note the little wooden chopping board built into the dividing space between kitchen and living room. I love details like that – because they tell me that this house – and this kitchen were meant to be lived in … functional and clever. The kitchen when I moved in. The “animal head” is from South Africa – made from reclaimed, recycled plastics. The sign on the upper left is an Irish version of “Keep Calm..” which says “Keep Going Sure Its Grand”. Glasses from Ikea. Kilner jars hold raw milk from the farm. Broadbeans also from the farm – freshly picked and about to be eaten! 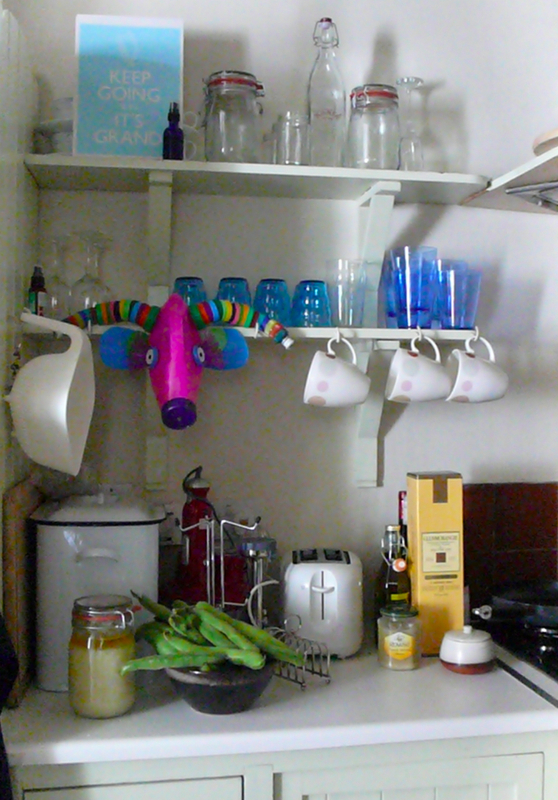 Kitchen with a new fridge, a sweet geranium plant, new knife magnet, and my favourite coffee maker (Aeropress). I love that the fridge is tiny – It makes me rely on fresh food rather than anything that sits in the fridge for too long. 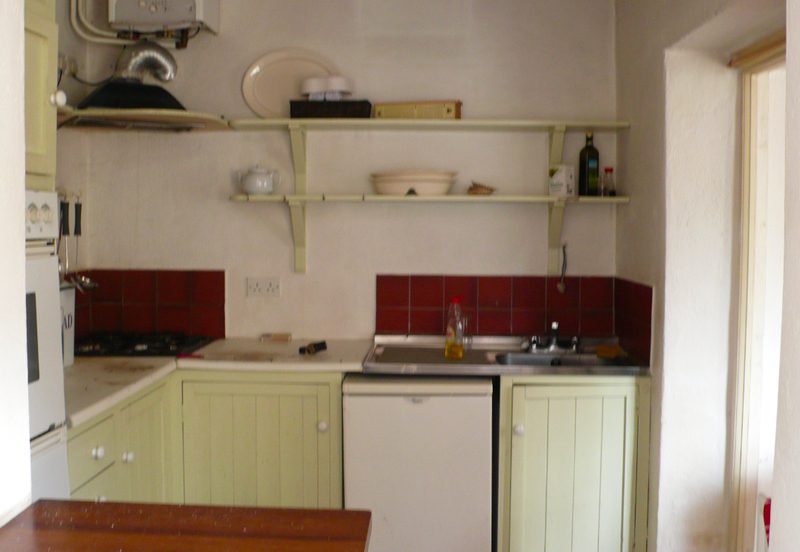 And its really a tiny kitchen – almost as small as my kitchen in KL – but its well organised and very easy to work in. 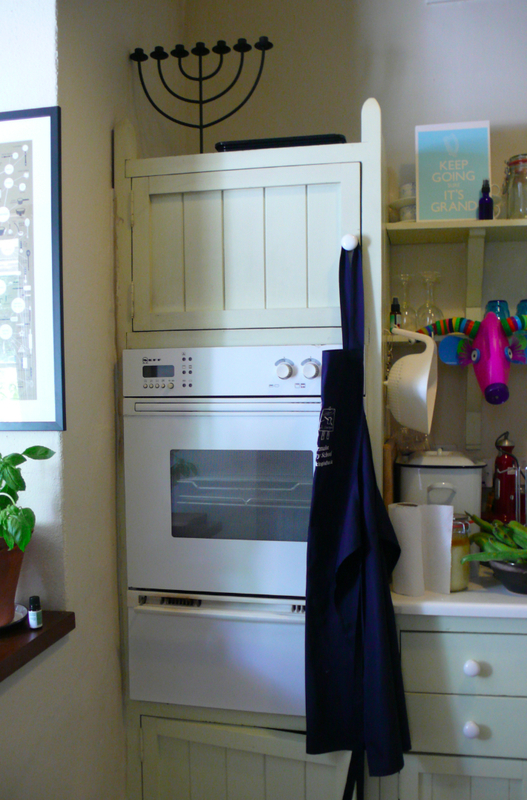 Double oven (of course) … and my Ballymaloe apron. The built in wooden cutting board that marks the divide between kitchen and living room. 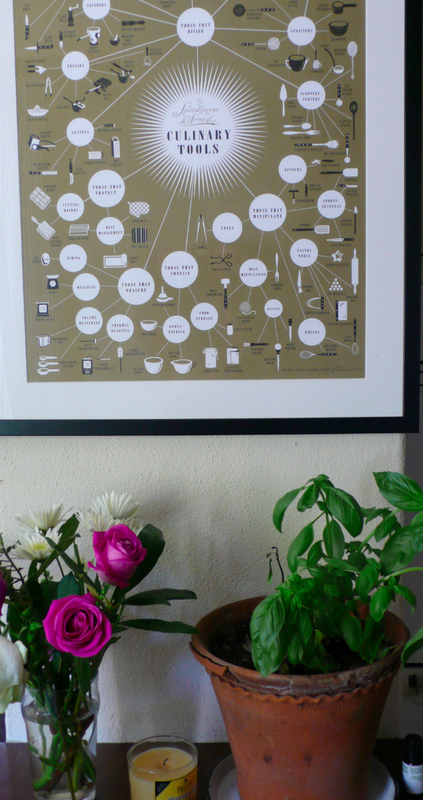 My basil plant – and the amazing print my sister gave me to celebrate my graduation from Ballymaloe. Isnt it gorgeous? 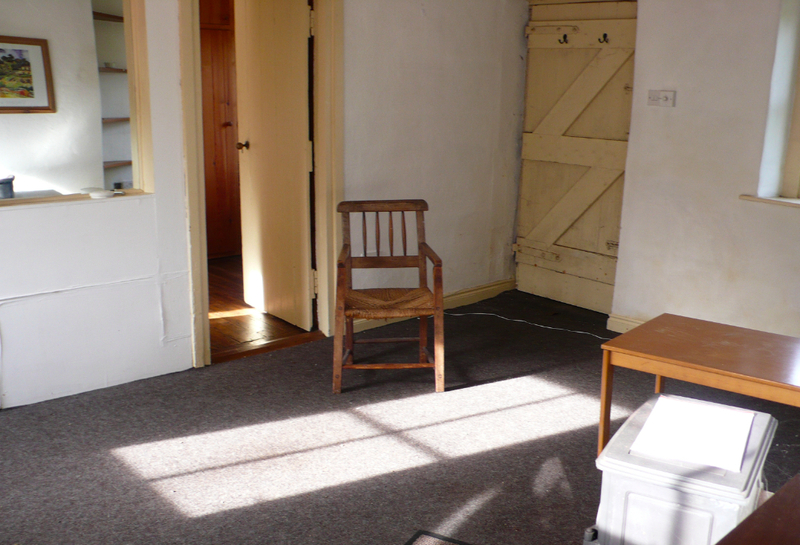 This is the living room as I first saw it in March 2012 – viewed from the kitchen. The front door is on the right. Entrance to the bedroom is on the left. Living room before I moved in – taken with my back to the bedroom door. 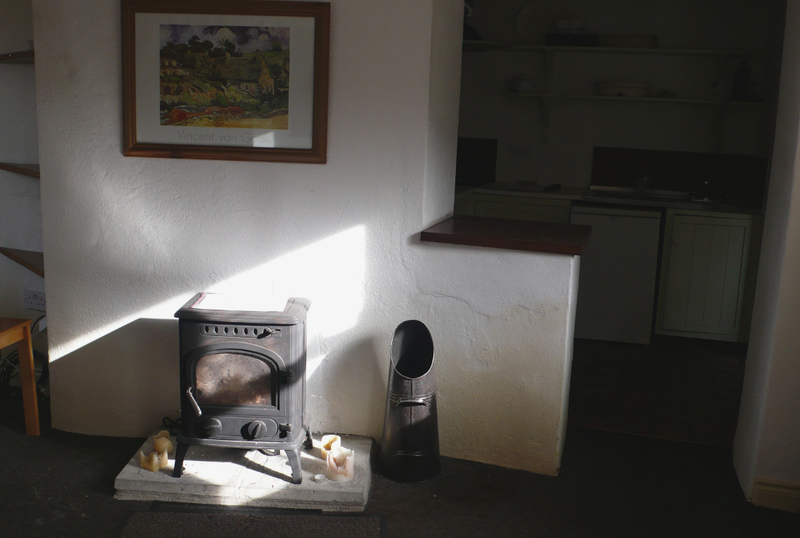 Fireplace (and Van Gogh print which I replaced) and view into the galley kitchen. Very faint view of built in bookshelves on the left hand side. Living room with a view towards the bathroom entrance (next to the built in bookshelves). 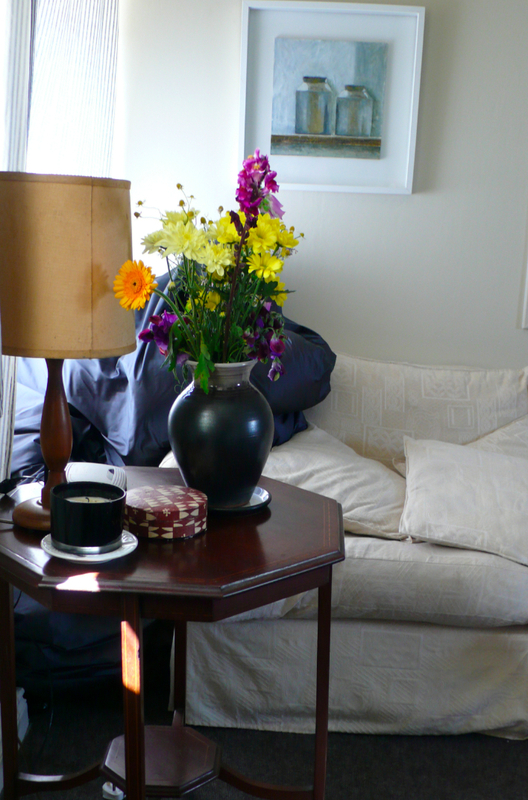 Living room when I moved in in May 2012 – once it had been repainted and the couches had been restored. 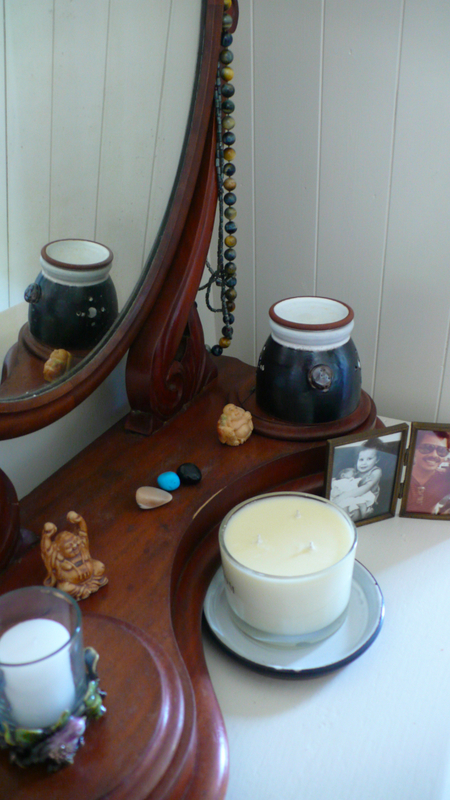 Lovely old candle holder on the mirror. 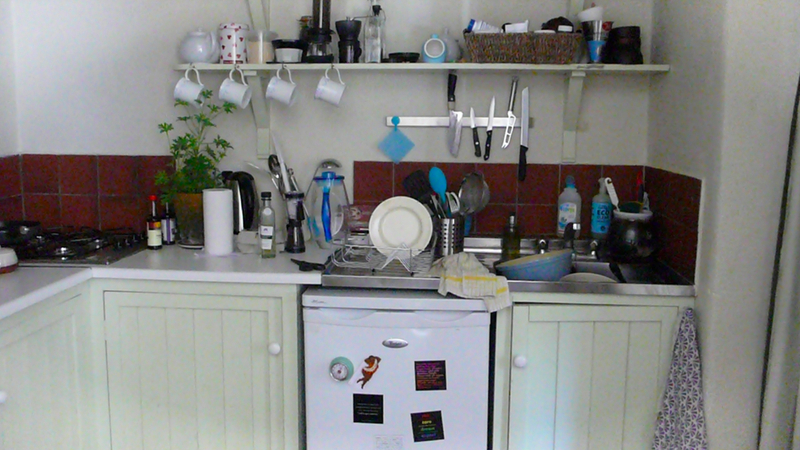 This photo is taken from the kitchen. Second couch, near the entrance to the bathroom. The window looks out onto the sea. 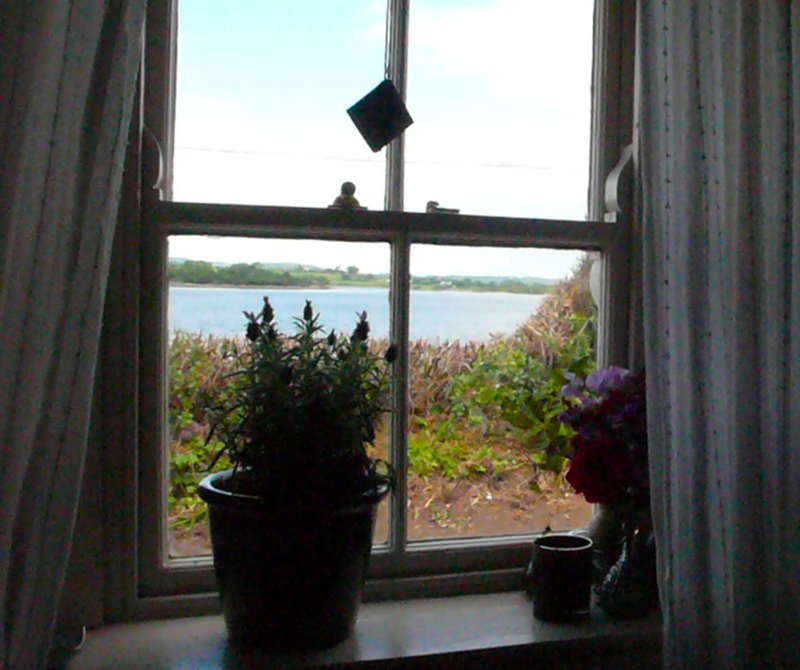 On the window sill, I have placed an Irish Ogham script which says … Blessing. Each time I stop to look out that window, it reminds me what grace I live in right now. 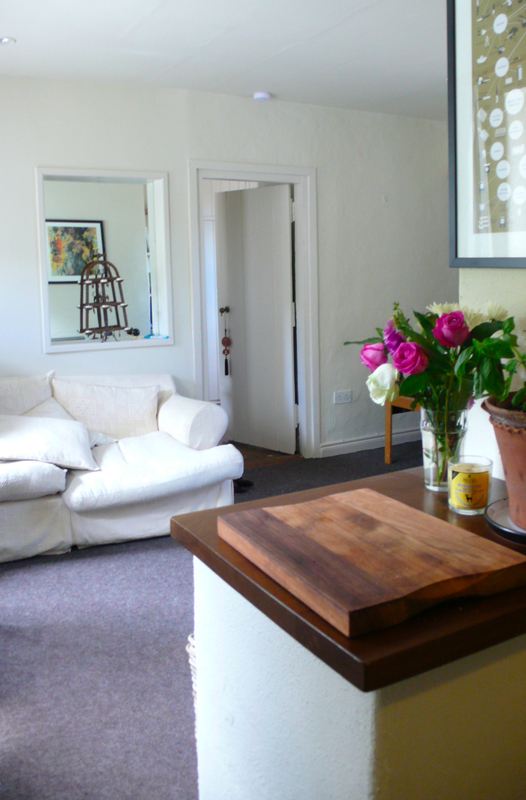 Another view from the kitchen – the main couch, beautiful old wooden table and restored wooden lamp. And a lovely painting of milk cans. 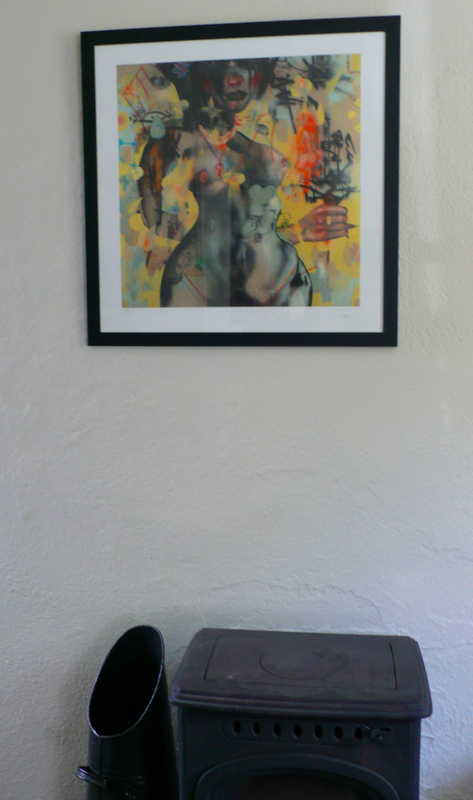 Im not sure who its by, but it just fits so perfectly into the house. View into the back yard from the living room. Note the lovely Penan basket – its so nice to be able to incorporate a bit of Malaysia into the house. And what makes me smile is the even lovelier photograph of the beautiful Z! 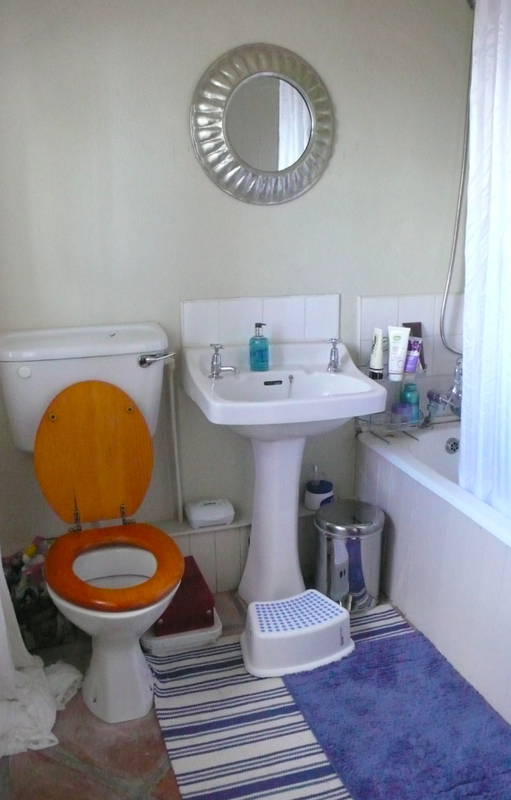 The bathroom, off the living room, as I first saw it in March 2012. OK I admit, it looks a wee bit grimy. 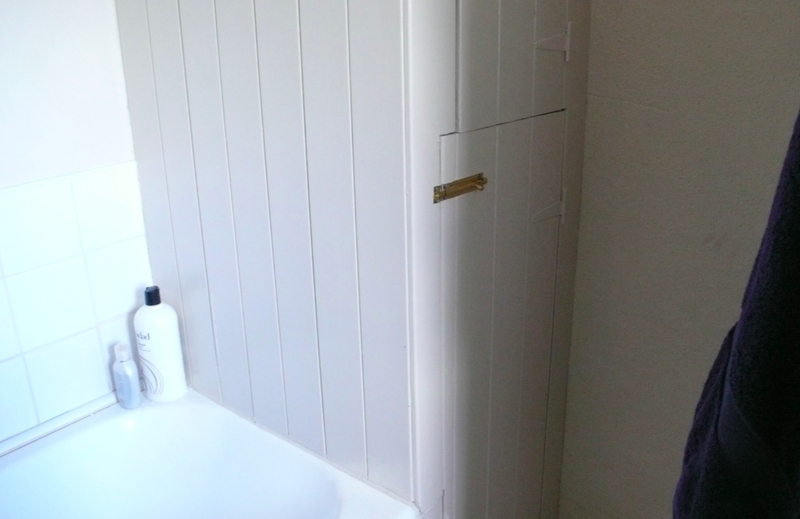 Bathroom cupboards in March 2012. Even grimier! View from the bathroom in March 2012 – the hedge hasnt been trimmed in years! Bathroom once I had moved in and it had been painted and cleaned up a bit – I love the blue and white combination. Clean and crisp and bright. Paint does amazing things – it just cleans it all up! The bathroom looks and feels pristine. 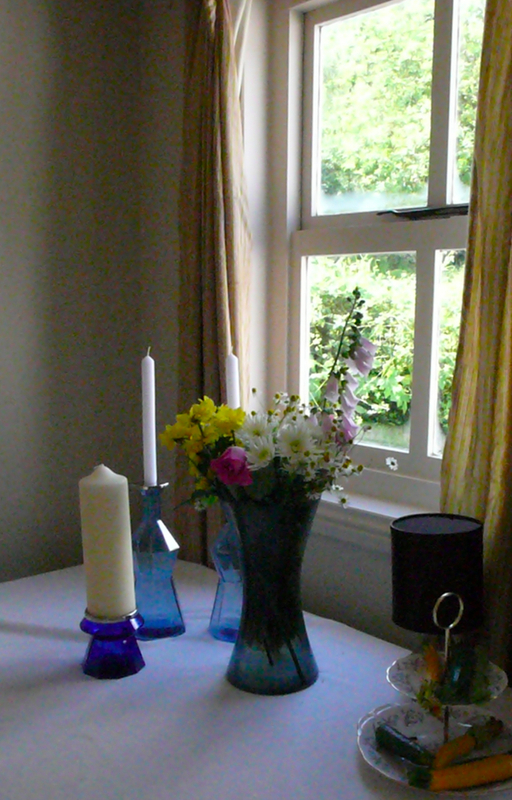 The bathroom windows – with beautiful muslin curtains from Ikea, fresh lavender and flowers … and hedges trimmed so one can see the water! 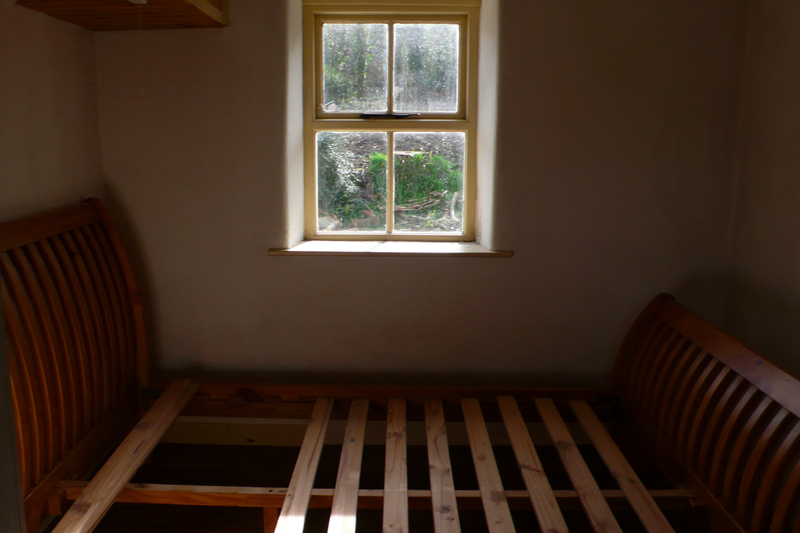 When I first saw the cottage, the bedroom was the room that inspired me the most – but also worried me the most. 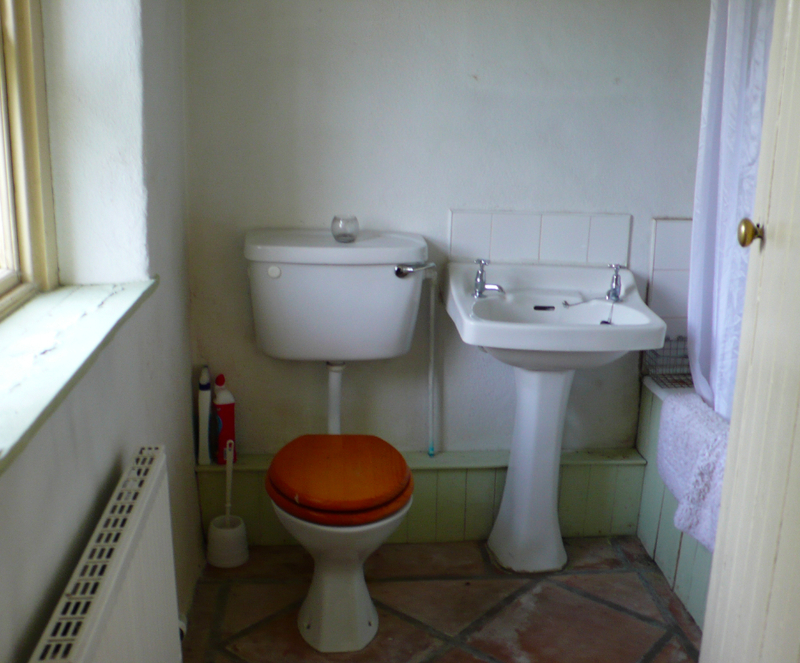 It had these gorgeous – what feel like original – wooden floors. Very rough hewn, organic and natural. I loved them. 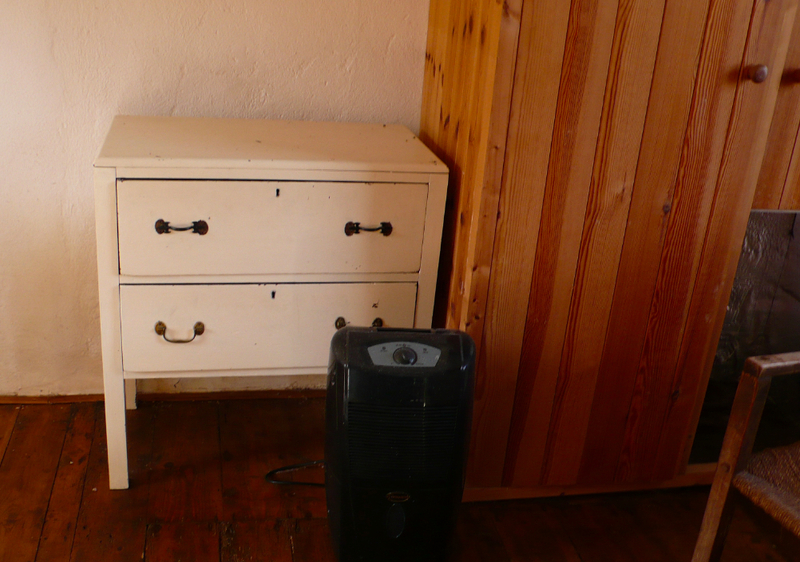 But the rest of the bedroom needed serious care. 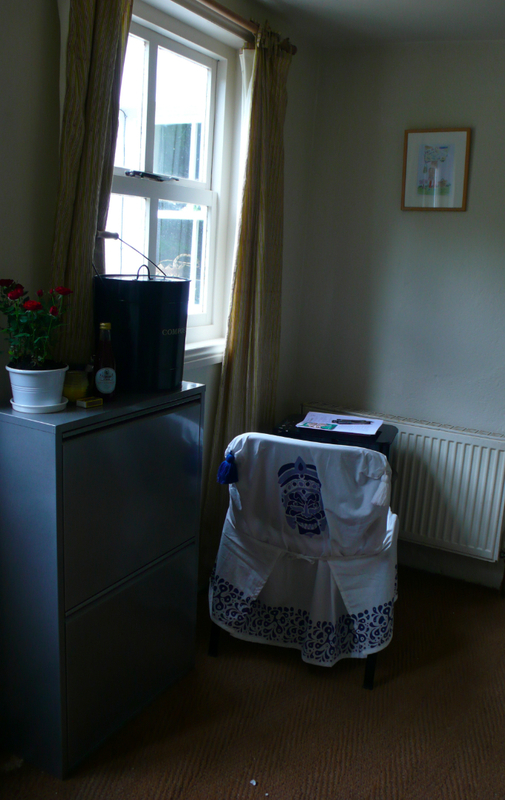 To the right of the bedroom entrance was a window that faced the water and two built in cupboards. 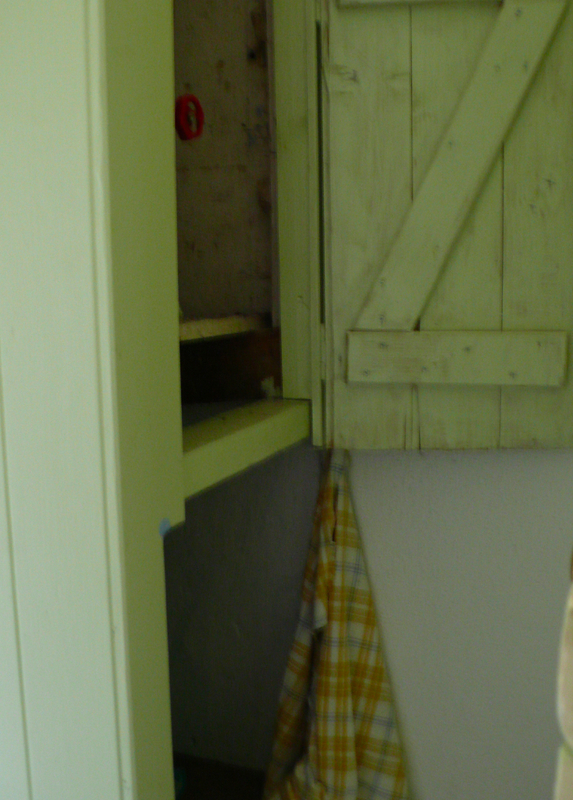 The cupboards were quite basic – in very rough pine wood. While they gave a huge amount of storage, they werent exactly pretty! 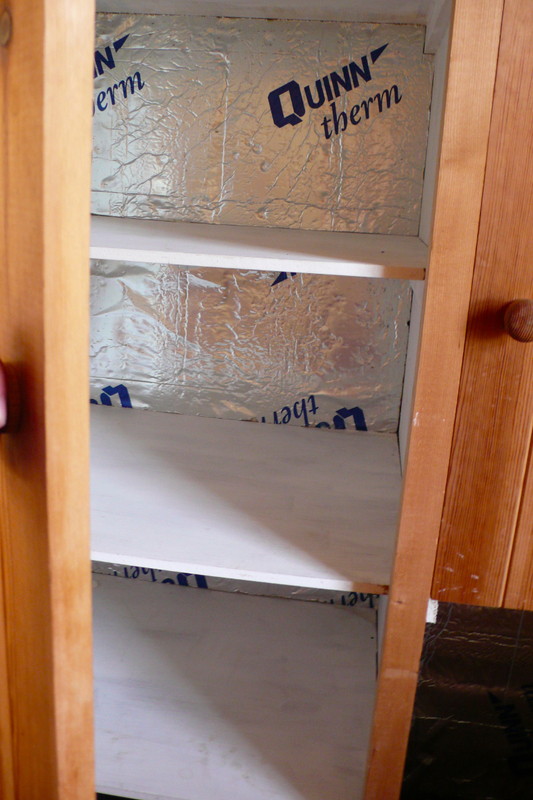 And inside the closets was not much better … However, at least I knew there was good insulation in the room! To the left of the bedroom door, was the piece of furniture which made me most happy – a gorgeous sleigh bed frame, which fit perfectly into the alcove. 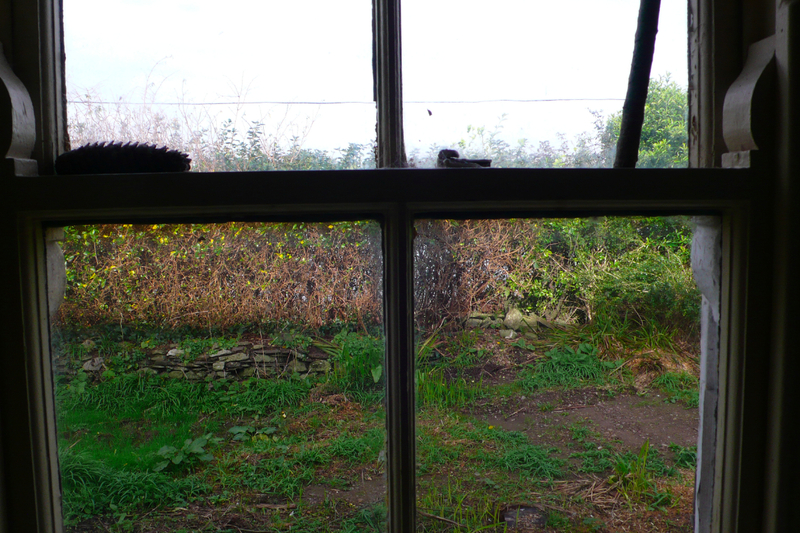 A window looks out onto the garden and back yard beyond. 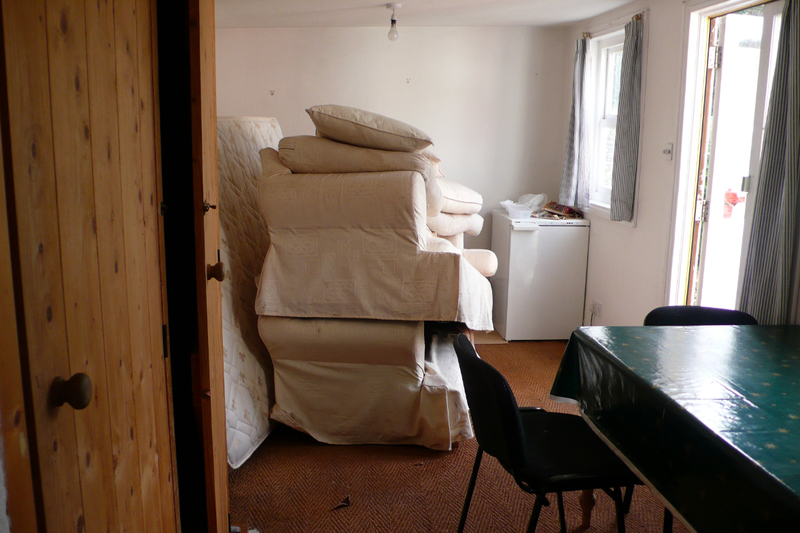 However, this side of the bedroom also contained the part of the house that most concerned me – a very clear case of mold on the walls and the ceiling. Definitely needed some help here! 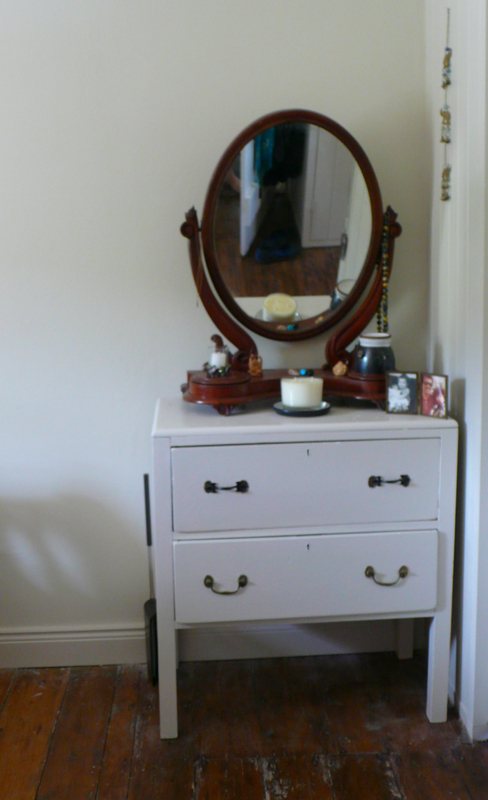 The rickety old bureau at the entrance to the bedroom has been transformed – by a good lick of paint, and a beautiful old mirror placed on top. Simple things make a huge difference. And what makes a space a home are the meaningful things which are placed carefully. My Ayah, my sayang Adik, my beads from my Goddess Mother, my stones from Spider and my Laughing Buddhas. These welcome me (and my loved ones) every single time we enter the room. 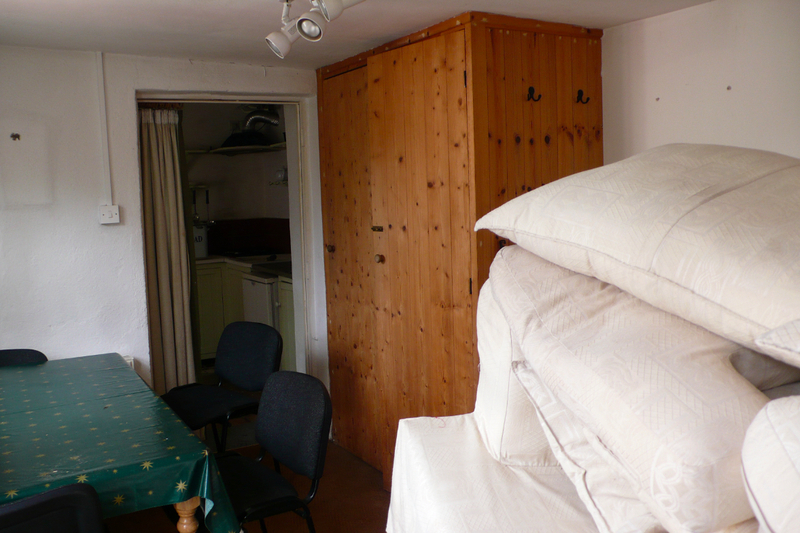 The built in cupboards have been completely changed – theyve been painted white, and bring such light into the bedroom. I added a gorgeous Indian rug which I felt gave colour and strength to the space. 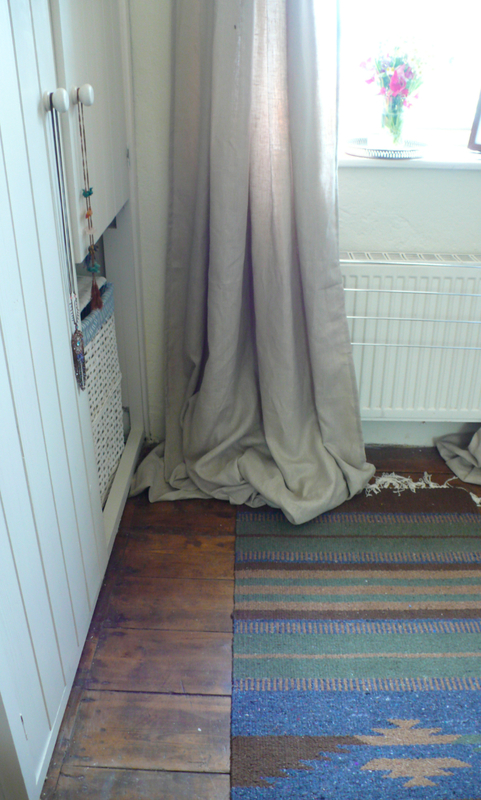 The curtains are linen from Ikea – I was going to buy dark brown velvet (dont ask where my mind was at!) 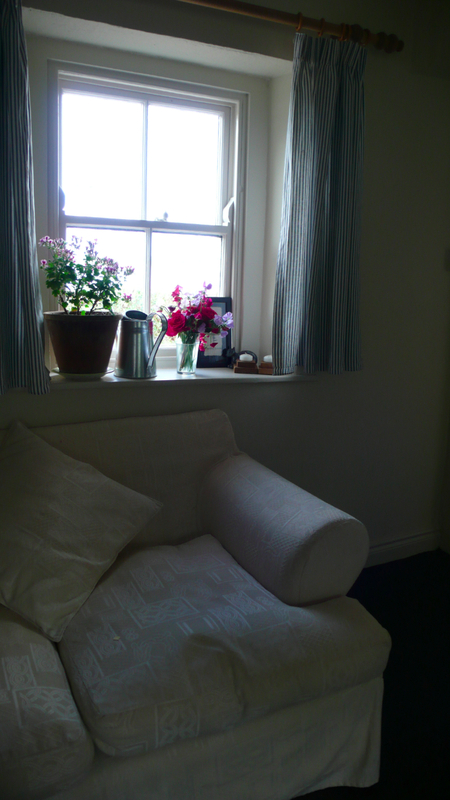 but thank the good Goddess for Gina who insisted I consider plain linen curtains. She was absolutely right – and I realise am learning all the time! 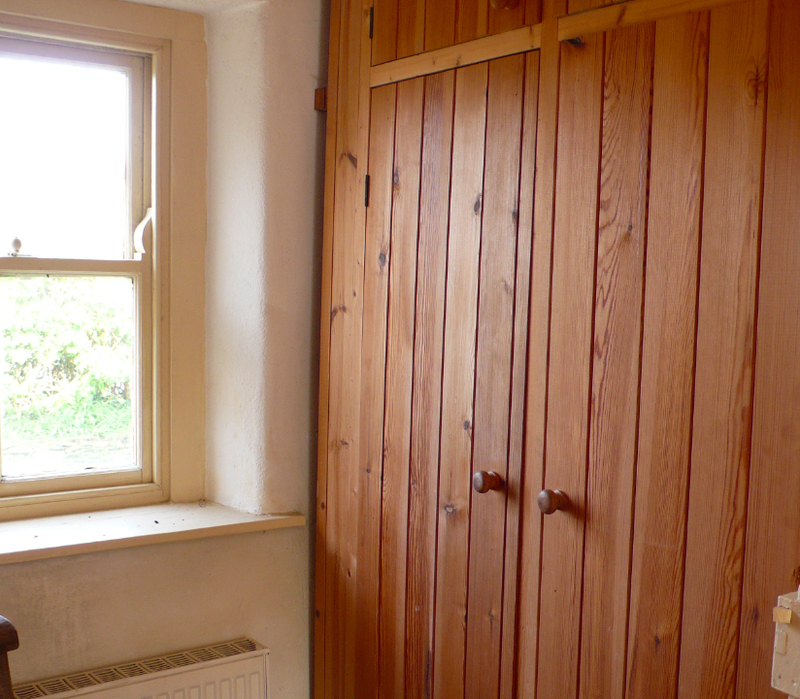 The interior of the closets has also been spruced up with paint and back wall colour. I lined the shelves with bright blue lino which I found very cheap at the local Co-Op – and I bought tons of blue and white wicker baskets to hold all manner of potion and lotion and bits and pieces. 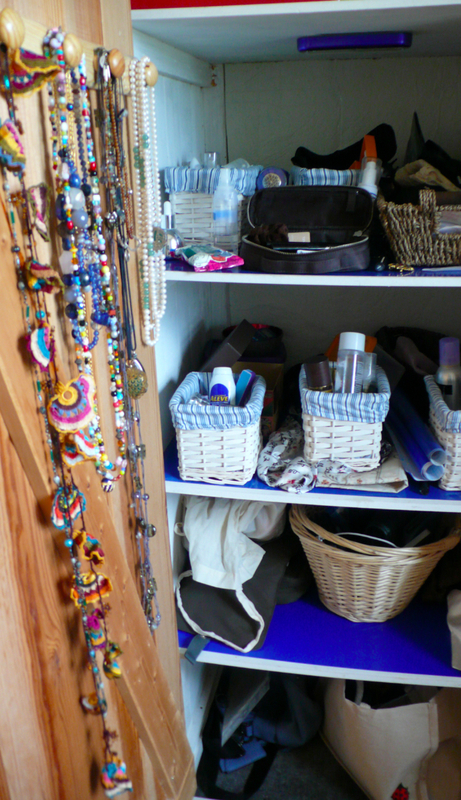 I also installed the pegs on the left, and hung all my necklaces in a pretty row. 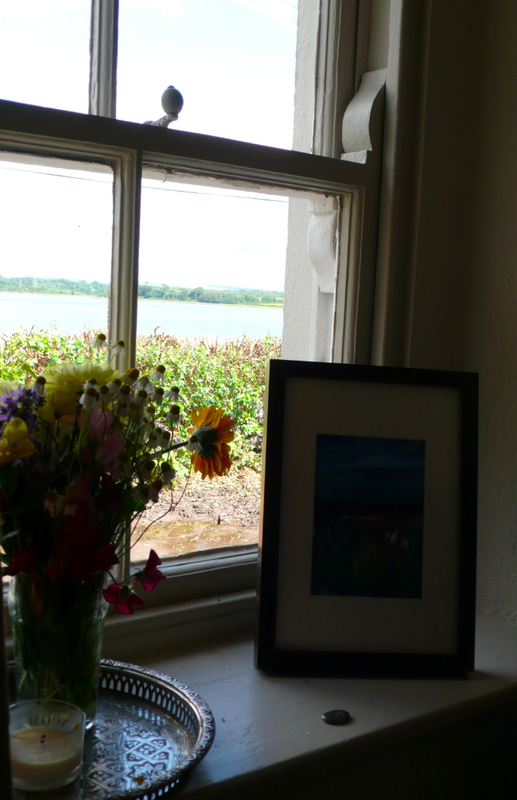 The window between the two (now cleanly white) built in cupboards holds a lovely antique tray I found at a second hand shop, and a water colour of a view of the sea. It is soul nourishing to wake up in the morning and look out at the sky and the water. Every day is different, and every day is beautiful. And to the left of the door, is my beloved sleigh bed. I added a mattress topper I got at Ikea (makes for a blissful sleep), and sheets I had always adored from Muji. 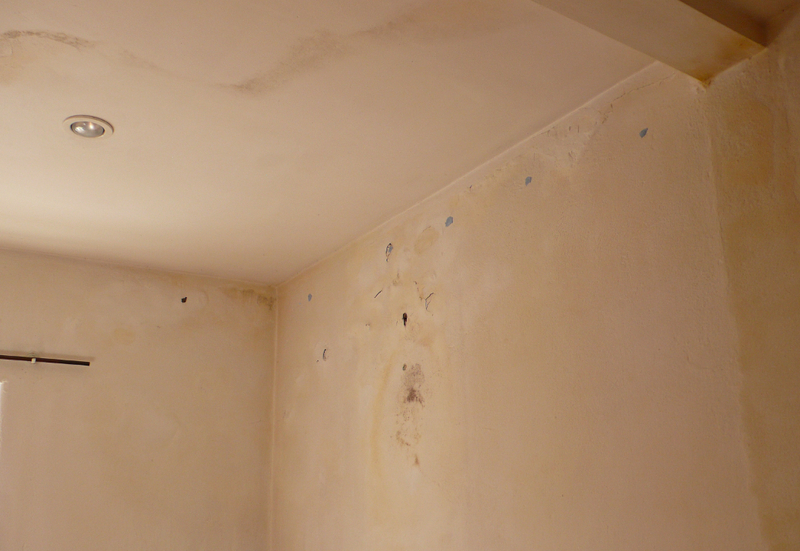 A lot of work was done here – they actually rebuilt the wall before it was painted and dealt with the mold issue. 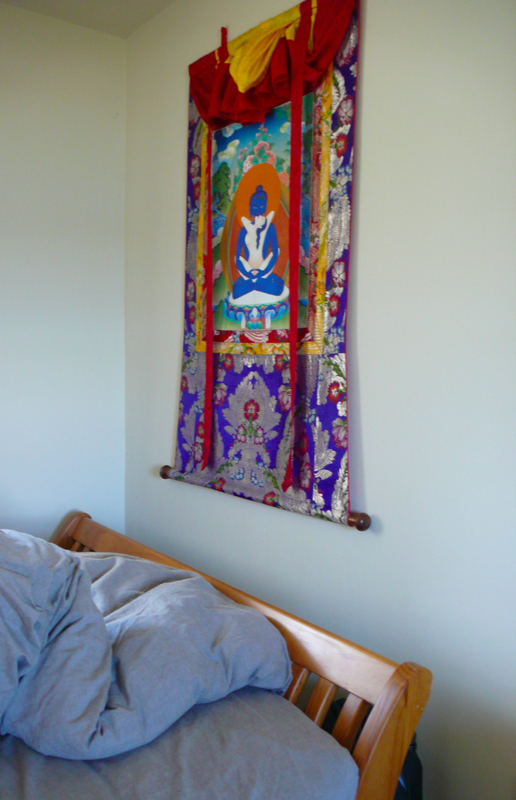 And I hand carried this precious Tibetan thangka from Malaysia and hung it as soon as I could when I arrived. It is the essence of creation – the yin and the yang – the balancing of opposites – the endless cycle. I sleep and I love in full view of the ultimate truth. 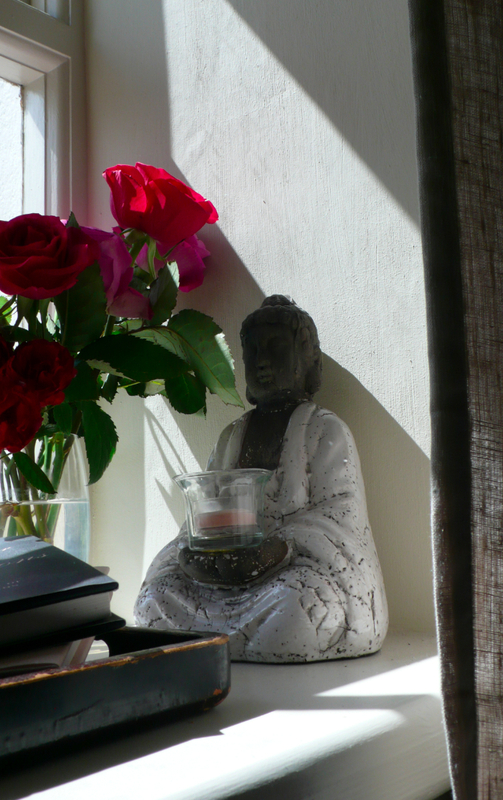 And nestled on the windowsill, by my bed, are always roses from the garden, and a Buddha to remind me of thankfulness and grace, beauty and eternal wisdom. My home, my solace, my joy.